The Antelope newspaper is the campus newspaper published weekly by students in the Department of Communication. Through JMC 350, staff and paid positions students gain professional experience in news management, writing and editing, photography and info-graphics, use of social media, design, and coordination of online development including audio and video. Students also complete the design and technology of the paper with InDesign. 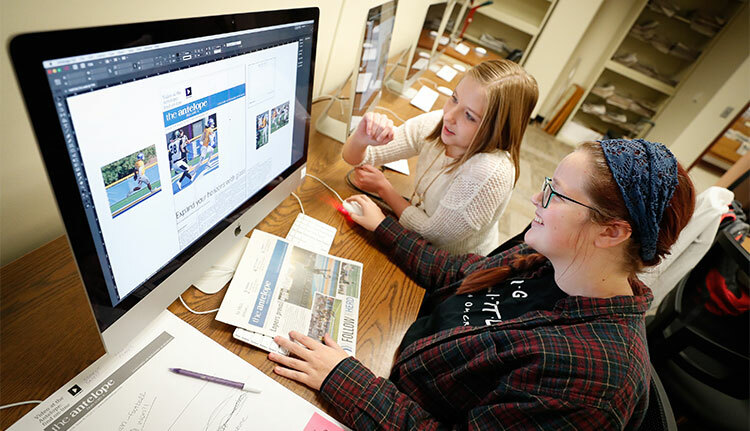 The Antelope Online is a combination of print and broadcast student productions. Students have the opportunity to be the Webmaster or online student-apprentices. Student managers include: managing editor, advertising manager, entertainment editor, photo editor, web manager, news editor, sports editor, design editor, designer, online editor, and managers including social media, special assignments managers, and/or circulation manager. Students often move from The Antelope to internships and are sought out for jobs in the field, both during college and upon graduation. Where are UNK Comm Students interning?